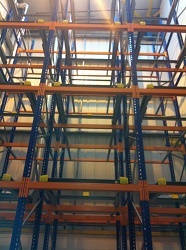 Warehouse Storage Solutions was invited to tender for replacing the existing Drive-In Racking as Morrison’s Supermarket in Bradford. After inspection of the fat tempering store, it was obvious that Drive-In Racking was not the correct solution for Morrison’s. 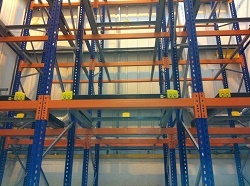 After visiting different options and offering various designs, it was agreed that the best solution for this specific project was Push Back Racking. 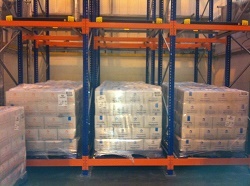 With the number of different food products that Morrison’s manufacture, the raw materials came in on pallets but the loads where different shapes and sizes. 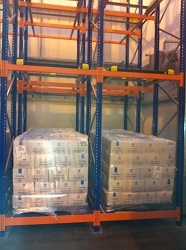 In an ideal world, the load on a pallet should sit within the confines of the pallet to be able to work in a Push Back system. Unfortunately, this was not an ideal world. 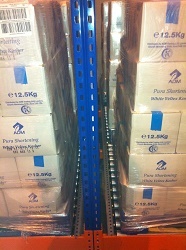 After looking into and calculating the different pallets that needed to be stored, the solution was to store the bigger loaded pallets onto push back roller beds at the first level, then use the standard push back carts for the square pallets above. The design involved overhanging the roller beds at the rear on the first level by 200mm to ensure that all bulky pallets could be accommodated. The project started with the dismantling of the Drive-In Racking and sprinkler pipework and then moved into the installation of the new Push Back Racking and re-attaching the sprinkler pipework. 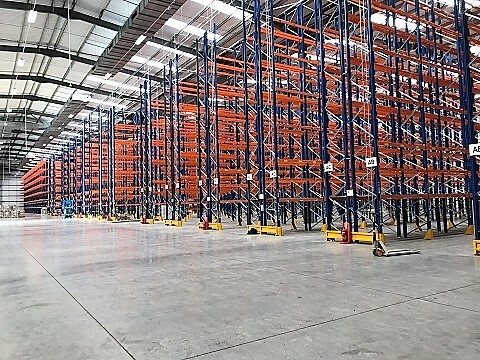 As always Warehouse Storage Solutions completed the project on time and within budget and we have now been invited to tender for additional work with Morrison’s.